When American karate practitioners became frustrated with strict controls on martial arts competitions that didn't allow full contact kicks and punches they started Kickboxing. Many questions were raised when the sport began about the high risk of injury. As a result, safety rules were improved and protective gear was added. As this is a relatively new sport there are no long-term traditions. The sport has undergone changes and been refined during the last two decades. Kickboxing uses both kicks and punches. Focus mitts, shadow boxing, and sparring techniques that are learned and applied under professional instruction. Fundamentals on the speed bag and the double end bag as well as the benefits of heavy bag workout help to improve coordination and better reflexes. 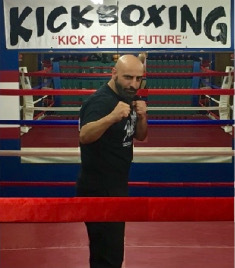 For more kickboxing information and pricing click here. Rocky's Dojo and Gym is proud to present Mixed Martial Arts Instruction. In this class you will focus on Stand-up fighting, Grappling, Boxing skills, Kickboxing, Fight Strategies, and Conditioning. During this class you will get full access to all the facilities we offer at Rocky's Dojo and Gym. For more information please call: (630) 466-7414. For more MMA information and pricing click here. The sport of kickboxing is the art of kicking and boxing in a fluid combination to confuse the opponent on what is coming. Working on jumping rope to start the class to get the blood circulating and then continuing in to a full body flexibility workout. Then working on kicking and punching drills. Heavy bag work and hand held pads are used to perfect hitting area and distance of kicks and punches. Boxing area with bag are used then drills and sparring is done in the 20X20 foot boxing ring. Serving the towns of Aurora, Oswego, Yorkville, Plano, Big Rock, Elburn, Hinckley, Montgomery, Batavia, Geneva, St Charles, Lilly Lake, Wasco, LaFox, Bristol, Kaneville, Maple Park, North Aurora, Naperville, Plainfield, Warrenville, and West Chicago.